Aside from working on marketing and listing items on Ebay, I have started reading some of the many personal development books I have on my Nook. I have gathered many books over the years and even months, that people have mentioned or have shared online through social media. I seriously LOVE reading books that speak to my mind, body, and spirit. I'm just that kind of person. Frankly, you have to take the time to get the good stuff inside of you when you're working as an entrepreneur. 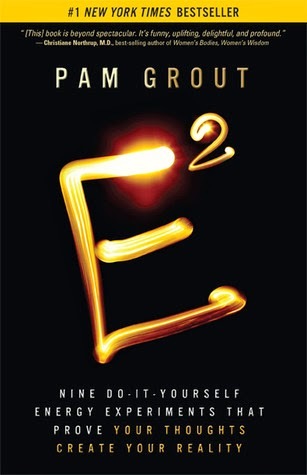 For the past couple of weeks, I have been feeling led to crack open a book called, E-Squared by Pam Grout. A fellow entertainment professional mentioned that she had read it. This was sometime late last year. So, you see how this is a little weird? When she mentioned it late last year, I bought it from Barnes and Noble for my Nook, which I have on my desktop computer and my IPhone. You can get it on either platform for free. I had SO much going on then but wanted to get around to reading it eventually. Move time forward to the present and I am constantly thinking about this book. So, I decided to buckle down and have this be the first book I read for my summer reading in 2014. This book takes you on approximately 21 days of nine (9), 48 hour or less experiments, to show how our thoughts create our reality. In the YouTube video (above), I share in detail, what is covered in the nine experiments. I also read a brief excerpt from the book about a gentleman named, R. Buckminster Fuller, who went from bankrupt and unemployment, husband and father at 32, to an architect, an inventor, an author, and great leader of men. You are not here by accident. You did not stop by this particular blog post or YouTube video by mistake. It was important for you to encounter and hopefully you will take the 'hint' and follow it to the end. P.S: Did you enjoy this summer reading idea? If so, share it with someone you know, using the social media buttons below.